It’s been a little hazardous around the house lately. First, remember how, when the kids were little, you’d have a Diaper Genie or some other hazardous materials receptacle for the diapers? I totally need something like that these days. I mentioned that M and Cute W have been doing a ton of soccer. And you’ve noticed, surely, that we had a long streak of soggy days followed by heat, right? Well, the combination is like the Perfect Storm of Stink. To make things worse, we don’t have central air conditioning, so even in the best of times, summer can get a little smelly. The trash has to go out more frequently, the laundry’s on a quicker rotation, a bowl full of fruit can transform into a very small toxic dump within a day. But seriously, the last few days have been The. Worst. Ever. The laundry turns terrible quickly, and that’s everybody’s workout clothes. 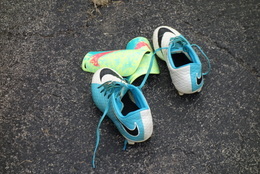 Meanwhile, I don’t even want the cleats inside my house. They’re being stored out on the pavement, in hopes that that the sun will dry them and bake away the bacterial stench. Unfortunately, M’s never out of her cleats long enough to let them dry fully. We’ve been Taking Steps. Cute W ordered a special sports laundry detergent that actually works pretty well, and it’s a little easier than doing the vinegar/baking soda soak I’d been using. I just ordered some charcoal stink-absorbing air-purifying bags. . . we’re still awaiting their arrival, but my hopes are high. Plus I bought some drier sheets just for stuffing into the various compartments of every sports-oriented bag we’ve got. I know, I know: I should thank my lucky stars that I don’t have a boy who plays hockey. I’ve heard that. But if you are ever in doubt about girl power in this regard, you’ve clearly never driven the car pool when 4 or 5 girls simultaneously roll down their socks and taken off their shin guards. Yowza. In other hazards, we were visited by a bat last night. It was just M and me at home, watching a little tv as I tapped at my laptop and she tapped at her phone, when suddenly M started yelling. 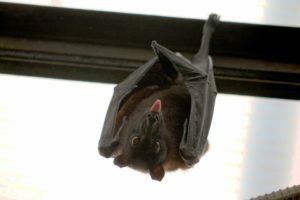 I don’t know where or how the bat got in, but it was swooping wildly through our living room and dining room. We both freaked out, and then I started laughing because the two of us freaking out was super-funny. M was shrieking on the love seat and I didn’t help her right away because I was trying to move my laptop from the floor to a table so we wouldn’t step on it in the melee, but the bat was literally swooping by every 3 or 4 seconds, so I kept ducking, and then I was laughing and trying very hard not to wet my pants because I was laughing so hard. Once I got the laptop on the table I ran to the kitchen for a broom, hoping that I could steer the bat outside somehow. Meanwhile M’s still yelling, and I scream through the walls, “I’ll be there in a minute, just put the blanket over your head! !” I came back wielding the broom, bristles up over my head, and the bat was still going nuts, swooping hither and yon. “M! Just go outside!” I urged. She lunged from the love seat to the closest door, a glass door that closes off the teensy, almost-entirely-useless front entryway. She got through it and slammed it shut behind her, peering at me as I dodged and weaved under the swooping bat. M started calming down a bit, and if she didn’t think to look up for the many, many bats that were likely flying over her head in their natural environment, well, I wasn’t going to tell her. Meanwhile, I was making zero progress. At one point the bat went through that glass door into the front entry, but he didn’t go out the front door and I didn’t close the glass door fast enough to shut him out of our living room. After that, the bat was flying without a predictable pattern and taking the corner between our living room and our dining room so he’d be out of sight, then he’d come roaring back. I tried to wave the broom to guide him toward one of the open doors, but he was super fast. As soon as I’d react and wave the broom around, the bat would already be in the next room. My efforts were starting to feel pretty futile. I needed back-up, so I looked out my side door toward the next door neighbors’ house just quickly enough to register that there weren’t any cars in the driveway–no help there. I turned around and. . . no swooping. No bat. I am still hoping that he just made it out that front door on his own. I walked all over the house. I wondered if the bat may have just gotten more mellow now that our shrieking had subsided, so I warned M first, then did some experimental shrieking. No bat. You know: that I know of. I feel your pain! We struggled with bats for years. I’m useful when it comes to catching them, because I become too hysterical to function. My husband is good at catching them, but after years of this and dealing with an incompetent chain pest-control company that I won’t name, we finally called “Batman” and have been fine ever since.